Help break news and affect public policy. Gain valuable job experience and career connections. All applicants must complete the appropriate application linked above. Applications must be submitted through the Brandeis University Student Financial Services student jobs portal. Need help? Let us know! There are two distinct journalism areas at Brandeis: an academic program and a research institute. The Schuster Institute for Investigative Journalism is a freestanding research center, where established journalists pursue major investigative reporting projects designed to appear in major media outlets. 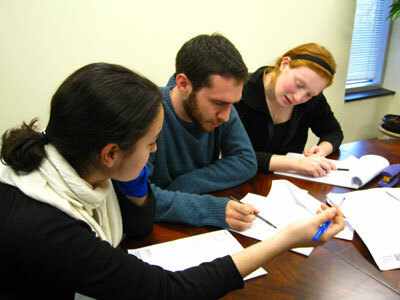 The Schuster Institute works closely with the Journalism Program within the American Studies Department. Although the Institute does not teach classes, we do hire students as research assistants, where under our supervision they conduct some of the day-to-day research required for in-depth investigative articles. Students get hands-on experience in a small newsroom atmosphere in one of three ways. They can earn internship credit towards a journalism minor; they may receive pay through the Student-Scholar Partnership Program, funded by the Women’s Studies Research Center; or they may be hired directly by the Institute. One of the Schuster Institute's goals is to help revitalize the practice of investigative journalism, so critical to a thriving democracy. In the process of reaching this goal, the Institute helps students learn about reporting methods, hone their critical thinking skills, learn to examine the gap between the official story and the facts, and understand how investigative reporting can make a direct and lasting impact on society. Students have said their experience working at the Schuster Institute has guided their career choices, given them opportunities to study social issues, further developed research and writing skills, and much more.